AT about this time last year I was emerging from a thoroughly enjoyable festive season and going through my slight annual dismay at the reading on my bathroom scales as I stood on them. Being overweight has never been a problem for me – even after it actually dawned on me that some people found it odd that I weighed so much. That particular realisation occurred at Mengo Hospital where my Aunt, Sister Joy Muwonge, worked and provided ready sanctuary whenever we suffered ailments. Going through some treatment course at the age of about sixteen, I was asked to step onto the weighing scales but that routine exercise ended with a group of medical personnel gathered round to confirm and double check the readings, as well as their machine. I stood at 80 (eighty) kilogrammes. They found it difficult to reconcile my age and my weight. I received warnings and words of advice that I took to be the routine from medical people, and life has gone on ever since with me accumulating more of these statements from a variety of people who did well in Biology and related subjects at school. After my university days, when I was master of my own domain and destiny and didn’t need to rely on anybody’s menu allocations to determine my meals, I generally hovered between 96 (ninety six) and a hundred kilogrammes. A lot of meat and unhealthy prepared staple food was involved in this. I also did not drink a lot of water or other such fluids that medical professionals would have listed as wise for consumption. None of that worried me, and even the reading at the start of 2016 caused me no alarm even though none of my t-shirts felt comfortable any more, and my trousers tended to twist about in discomfort as if to give me hints of what I should be feeling. The scales in January last year said I was 117 (one hundred seventeen) kilogrammes. My suspicion was that the meals during the festive season had been exceptionally heavy and my exercise pitifully low, and I went about trying to correct it somewhat. By April not much had changed, as my past corrective measures had been compromised by the busy political period and other excuses I cannot go into right now. And then in walked a lady called Lucy Ociti (+256753471034), from the Fat Loss Laboratory. She had tried to track me down with little success for a number of weeks and when she eventually did I marvelled at her luck so much so that I had to give her two minutes. Just two minutes. She couldn’t even pitch her solution properly because I kept interrupting with specific questions. I despise diets because I have spent most of my life (at this point) seeing my wife suffering through them quite unhappily. I was happy to try one and show the loved one that: 1. I was capable of dieting myself and; 2. it was possible to diet without suffering. I knew 1. above, and the questions I asked Lucy proved 2. above because the diet involved meats (besides pork) and allowed for some light cream salad dressings. The cost made me hold my breath a little but turned out to be the best Ushs1.5million I spent all year on anything personal. Following it more strictly than some people do religion, I got mid-way and thought I was on the verge of hitting my weight target. See, I thought a lot about how it worked, exactly, and then realised that it revolved around science we had learnt back in school. Those lessons about food values? The manner in which the body processes food, creates energy, stores fat and so on and so forth? We know all that. We studied it. People took up sticks and beat us for getting answers wrong. And for some reason we grew up into adults without understanding it. When my scales told me I was merely 90 (ninety) kilogrammes, I proudly went over to Lucy to proclaim victory and inform her I was en route to a platter of pork ribs within a matter of weeks. She was impressed, but still whipped out her own weighing scales – digital, this time – which said I was 99 (ninety-nine) kilogrammes, fully clothed and pockets full. Some people think I have lost more than thirty kilogrammes, some think I must be ill, and others keep asking me to convey their regards to my big, older brother Simon. I am now fitting into clothes sizes I last saw in my university days about twenty years ago. I have punched four extra holes into all my belts in order to avoid an embarrassing incident involving jeans slipping down to my ankles in public. And I am still at some risk of that happening. Yet I am still overweight. Today, I oscillate between 90 (ninety) and 92 (ninety two) kilogrammes in the morning, and I still eat carefully, following the Fat Loss Laboratory principles. It makes for an easier approach to weight loss and fitness related resolutions. It has also underscored how much of what we learnt in primary school actually applies to the real world. Both these realisations are going with me into this new year of Hakuna Mchezo weight control and weight loss. FOR months now, my neighbourhood association has grappled with the very disturbing problem of empty plots. These are plotted pieces of land on which buildings have not yet been erected and that, therefore, attract unsavoury characters with undesirable, distasteful habits. For various reasons on top of just the pain of looking at them, the empty plots are particularly irritating for the residences that occupy the spaces closest to them. One reason is the tendency some characters have of haphazardly dumping garbage on such plots, which besides the offensive smell leads to an accumulation of vermin that gets pursued by snakes. Another reason is the shrubs and bushes that thrive on the putrefaction and grow annoyingly healthily to heights that serve only one purpose – providing cover for criminals of varying degrees of danger and menace, including those misguided young fellows that gather in groups to take turns puffing away at rolled up herbs rarely found in domestic kitchens. And, linked to that, are the swarms of mosquitoes and other insects that breed within these plots. Our problem was so serious that we fired off letters to the city authorities and have kept pushing for something to be done, short of claiming the plots ourselves and putting up buildings thereon. We identified a couple of the plot owners and one of them agreed to keep his plot clean and cleared, but the other went silent knowing our reaction would be muted (one day he will be shocked to find activity on his plot, as you will see later). This problem exists in many more than just my neighbourhood, and as we were on the verge of forming an association for ‘People Irritated By Empty Plots’, I fell upon a television programme that introduced me to the Huertos of Cuba, and have re-aligned my approach. I believe that Huerto, in Spanish, means something along the lines of “kitchen-garden”, or “small vegetable garden” or “market garden”. The story goes that after the collapse of the Soviet Union in the early 1990s, Cuba found its most powerful economic partner was no longer in a position to provide the support it needed. The country was faced with its own economic collapse, in the face of serious difficulty being such a close neighbour of the United States and at the same time its most rooted enemy. The most urgent problem the country faced, at that time, was a looming food shortage because food agriculture was generally quite low as the country had focused on industrial agriculture for export mainly to the Soviet Union. The country declared an economic crisis and introduced food rationing, which led to the malnutrition in families. At the same time, because the economy was doing so badly, there were hundreds of empty or disused plots within the city – in particular, the capital, Havana, where businesses had shut down and buildings had been abandoned. The Cubans put two and two together and started to plant their own food on those empty plots, and before long the government took up the task of officially supporting these efforts, creating a system of agriculture that is to this day feeding the country on healthy, organic vegetables. It has been so successful that the Cubans have introduced a new word into agricultural lingua: “organoponics” (organoponicos, in Spanish) – the use of organic materials from crop resides, household waste and animal manure, to grow domestic crops. It is not awkward, in Havana, to find a commercial building standing tall next to a neat and lush garden of vegetables along a high street; or a home with soil bearing healthy vegetables all growing on the roof of its garage. By 2013, according to some official accounts, half of Havana was under agriculture. One Food and Agriculture Organisation (FAO) report states that in 2012 these ‘Huertos’ produced 63,000 tonnes of vegetables, 20,000 tonnes of fruit and 10,000 tonnes of roots and tubers! THIS is what is going into our neighbourhood’s next letter to the city authorities here. Rather than attempt to confiscate the empty plots that make life so difficult and uncomfortable around us, we will be asking for permission to turn them into neat, flourishing and highly lucrative gardens. Besides, our soils here are much, much better than the Cuban soils, so we will need even less work on the organoponics, even though it will help us dispose of our organic waste more productively. I MADE a decision to stop watching the Oscars and Grammies back in the late 90s when, one night as we were gathering to watch the glitzy ceremony, Paul Busharizi burst into a typically uncontrollable fit of laughter at me. Our viewing station was the kazigo next to mine, and as we walked past my door I smoothly inserted and turned the key in the door lock, unlocked the padlock, threw back the bolt, pushed the door open and quickly tossed my notebook into the dark room where I was certain my bed was located, almost without breaking a step. Bush was impressed at the fluidity of my movements, but that quickly broke down into his fits of laughter when my notebook landed onto the edge of what sounded like a plate with crockery on it, bouncing it into the air to crash land into some other items of an indeterminate but loud, clattering nature – muffled as I shut the door within seconds of having opened it. As usual, I endured his ribbing and it didn’t hurt my feelings because it was really funny. But I became alive to the idea that I was putting aside these hours to watch the glittering world of Hollywood’s richest and finest in their splendid clothes at expensive hotels, from the comfort of a squalid one-room muzigo off a very fair sized colour TV. So I have tried over the years to bring some glitz and glamour into my own little life in whatever small measure, even if there are no lights and cameras involved. Part of that has been supporting stages for our own entertainment industry to claim some of the prominence and attention the Oscars and other such shows seem to own. Further opportunity to do so showed itself when, for the last couple of weeks on the international scene an uproar erupted over racism in the world of entertainment, under the hashtag #OscarsSoWhite. #OscarsSoWhite rocked social media almost as much as #BlackLivesMatter – which came up because of all those killings that involved white (police)men and dead black men – also racism. #OscarsSoWhite arose because people were indignant that ALL the nominees for the Oscars this year were white – no blacks were deemed good enough to be nominated for these prized awards, and social mediaratti lost its collective control. This was just weeks after Ugandan model Aamito Lagum was the subject of racist comments from ignorant and angry seemingly ‘white’ people, indignant over her inclusion in an ad for some high-end cosmetics – and that resulted in the social media campaign #PrettyLipsPeriod. As all that was happening on the global scene I paid a visit to my daughter’s school and noticed once again that there were many posters, motivational messages and text book pages that feature non-Ugandans (their being white should not be the central issue). As we waited to chat with her teacher, I received a couple of those ‘Good Morning’ and ‘Have a nice day’ WhatsApp messages with images of non-Ugandan (let’s not say ‘white’) babies, and my irritation bubbled over. I immediately resolved to create my own WhatsApp greeting images using my own children (coming soon to a phone near you), in order to right the global imbalance between black and white. 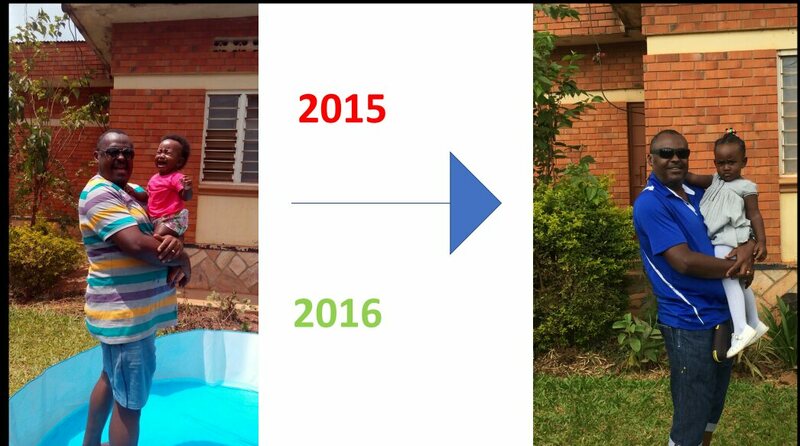 I am also creating for my daughter’s school motivational posters and messaging using images of ordinary, local Ugandans. Even before vying for Oscar-winning roles, I am certain that creating more Ugandan content will right any so-called racial injustice and counter #OscarsSoWhite more effectively than a hashtag campaign. If we allow our children to settle for a muzigo with a TV on which to watch the Oscars they will never get to the damn show either, let alone believe that they can create their own respectable alternative.